Hundreds of cooks lined up for the World Pasty Championships this weekend - appropriately held on St Piran's Day. 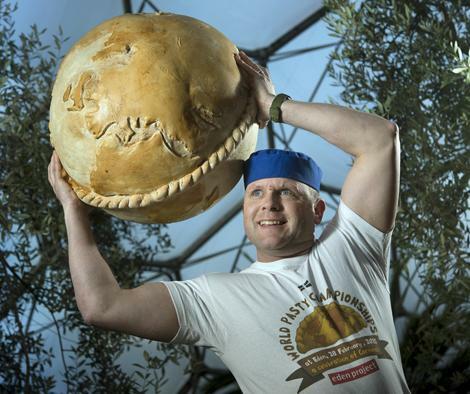 The head chef at the Eden Project in Cornwall has cooked up a novel way to mark the beginning of the World Pasty Championships - by creating an enormous Cornish pasty in the shape of the earth. Tony Trenerry spent more than eight hours slaving over the colossal snack. It's 70cm in diameter, and needed an extra large oven. He said it was the toughest, and heaviest, baking challenge of his career. He said: "I was inspired by the amazing collection of competitive pasties at last year's World Pasty Championships and wanted to do my bit to inspire entrants to this year's competition. "Word about the competition is spreading and, as well as local bakers, we have had interest from around the world, including enquiries from the US and Canada." I was inspired by the amazing collection of competitive pasties at last year's World Pasty Championships and wanted to do my bit to inspire entrants to this year's competition.